Throughout history, beautiful gems have been the prized possessions of kings, artisans and lovers alike. Now as then, wealthy clients send gem dealers to search the world over for the finest stones to add to their fortunes. In a back room of The Club Hotel in San Isidro, Peru, you face rival dealers from other gem syndicates. You use cunning, strategy and a little bluffing as you bid against each other for the precious stones that will complete your client's collection - and perhaps line your pockets as well! Originally published in 1993 as Attacke, this Knizia classic has gone under the radar for far too many years and is sure to capture the attention of game geeks and casual players alike! FRED has re-themed the game with beautiful bits (25 gleaming acrylic gems in 5 different colors) and retooled the rule book for clarity and simplicity. The resulting product is an old classic that looks and plays like Reinerâ€™s latest and greatest! For 3-5 players over 8 years old, this 30-45 minute game can be played as a light filler or repeatedly for a much deeper entrÃ©e. 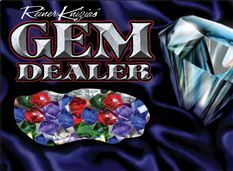 Gamers who love to play with their game pieces while they consider their next diabolical move wonâ€™t find a better game than Gem Dealer! Artwork by well-known Eagle Games artist Paul Niemeyer. The object of this fabulously re-themed Reiner Knizia collecting game is to be the first dealer to gather one gem of each color. Players bid cards from their hands in a competition for any one color, and must decide whether to bid heavily now to secure the prize or save your cards for a final coup dâ€™etat. Whoever bids the most in any one round collects a gem of that color, but can only draw one more card from the draw pile. This simple rule results in a game of terrific tension, as players wrestle with short-term and long-term needs every time the decision to bid or pass comes back to them. Great for families, get-togethers or even travel, Gem Dealer is destined become a much greater classic than the original game that inspired it. I have been collecting this whole Gryphon bookshelf series and this was one of the last ones we tried out. We loved it so much and wish we had tried it sooner. My parents love it and they are not big gamers. I love making someone put a gem back after they think they have it locked up with the wild 10 card. We usualy have to play several rounds after we get it out.